While we'll never stop pinning large kitchens to our dream house board (this one is at the top of our wish list), the reality is that most of us just don't have the space. But where our size-challenged studio apartments may lack in magnitude, they make up for in serious style. We'll never let a small room stop us from designing a cool, polished space. In fact, it just fuels our creative fire. It's a challenge we're only too happy to accept, and Rebecca Winward, designer and author of Space Works agrees. In a recent chat with Winward, she said getting creative was her number one rule for designing a small kitchen. "Use every inch of space by thinking creatively," she explained. "Look for storage solutions that can help you utilize otherwise unused space, such as a pan rack (hung above the sink), kickboard drawers, or rail systems that use the space between worktop and wall cabinet." Ahead, Winward shares more of her out-of-the-box ideas for designing the small kitchen of your dreams (including what she would never do) and her top five kitchen design styles—which one will you choose? When you approach the design of a small kitchen there's one design philosophy Winward would like you to keep in mind. "Don't compromise on function for the sake of form," she stressed. "If something is utterly gorgeous but too big/small/impractical for your space, then don't buy it. Wait until you're able to find a piece with similar aesthetics but the right proportions and practical qualities, too." Sage advice, indeed. With any space, large or small, it's the smaller design details that turn a house into a home. Those nostalgic moments and sentimental details that remind you of your childhood or travels gone by really pack it with personality. "Soft furnishings and wall art can make more impact than you might think," she said. "Even a magnolia-painted room with few architectural details can be transformed with some carefully chosen pieces." If you're concerned about budget, Winward says you don't need to spend a lot to create a sumptuous effect. "Art doesn't have to be costly," she explained. "Check out local exhibitions to find affordable originals, or for an even lower-cost option, you could frame postcards, greetings cards, or calendar pages." As the hero of the home, it's important your kitchen speaks to your lifestyle. It's all about how you want to use the room. "The best designs are those that involve a careful analysis of the functions that will be performed in the space, which means a lot of questions will need to be asked about your lifestyle," said Winward. Is there a particular type of cuisine you enjoy making? What else do you want to use your kitchen for? "Then, to boil it down to its simplest explanation, the design evolves from how these functions can be best fitted into the space that is available," she explained. Now that you're at the planning stage, it's important to have a realistic mind-set. We all know kitchens can be costly, and while there are some cost-efficient things you can do along the way, others are unavoidable. "Realistically speaking, the cost will depend on what's already in situ and what you want to achieve," said Winward. "Cosmetic updates such as new worktops, new splashbacks, new doors, or simply a lick of paint can achieve an entirely different aesthetic, but if your units have seen better days, or the existing layout isn’t a practical one, then there may be no sidestepping a larger investment." However, there are ways to keep costs under control. "You might want to consider employing an independent designer to create plans for you (although this option involves an upfront fee); you're then able to get showrooms to quote on a comparable basis and avoid the upselling that might happen when you get a design completed by a showroom's sales designer," Winward explained. "You could also consider buying ex-display units or taking a more creative approach to the space with freestanding furniture or with reclaimed materials (sometimes a local craftsman can make something bespoke for a very reasonable outlay)." Not everyone has the luxury of designing a kitchen from scratch, but, as Winward explains, there are some simple updates we can make that don't cost a lot or require a major renovation. "You can get specialist paint formulas that are great for updating cupboard doors, and even some that work on tiles," she said. "Just make sure you choose your color scheme wisely. Too pale and clinical and you’ll just highlight your kitchen's imperfections, while too bold a color can seem clumsy and could give away your DIY secret. Knocked-back, muted shades are a safer bet. And it might sound simple, but sometimes a really deep clean and some different accessories might be all that's needed. "Consider having your floors professionally cleaned," she said. "Even grubby grout can be made to look fresh and new, and then sealed to maintain the floors' good looks." If there's one thing you should you never do in a small kitchen, it's "try to squeeze in too much functionality." She explained: "Just stick to the basics you need for cooking and household chores, choosing compact appliances wherever possible. It's also best to choose a sleek aesthetic and keep worktops as free from small appliances as possible." When designing a small kitchen (especially one on a budget), it pays to keep it classic so it stands the test of time. But that doesn't mean you should dismiss the design trends entirely. "One of my personal favorites in terms of aesthetics is the use of warm-toned metals in brassware and cupboard knobs and handles (copper and rose gold tones look particularly beautiful against gray cabinetry, which shows no sign of losing popularity)," said Winward. "Natural wood is also big news, whether reclaimed and distressed or as a sleek veneer, while I think handleless cabinetry is a look that’s going to be current for a very long time." But the best design trend is one that combines fashion with function, and if you have a small kitchen, then space-saving ideas are always welcome. "On a practical level, I’m a fan of boiling water taps," she said. "They allow you to dispense with your kettle, thus freeing up countertop space. Filter taps are also great so you have no need for a filter jug in the fridge. I’m also excited by technological advances such as downdraft extractors, which negate the need for a cooker hood, and induction hobs that are built into a porcelain-ceramic worktop surface—though, of course, these cutting-edge innovations are only really accessible to those with a larger budget (for now, at least)." Country Kitchens: "Cozy and welcoming, the country kitchen can be rustic or slightly more refined, but it will always make use of tactile natural materials such as wood and stone." Eclectic Kitchens: "Almost anything goes in the eclectic kitchen, as long as it's stylish. The key to success is ensuring that there's coherence and balance when it comes to color, texture, proportion, and detailing." Industrial Kitchens: "Practical and hard wearing, industrial kitchens are true workhorses with utilitarian elements in wood, metal, concrete and brick. It's a frugal style that can suit large or small spaces." The White Stuff: "Pale and interesting is a perennial favorite. It's a look that is not only timeless but easy to achieve and very pleasant to live with (thanks to the way the color bounces natural light around the space)." Family-Friendly Kitchens: "With an emphasis on practicality and a relaxed feel, family kitchens may follow any aesthetic, as long as the materials used are easy to clean and can stand up to the rigors of life with kids." 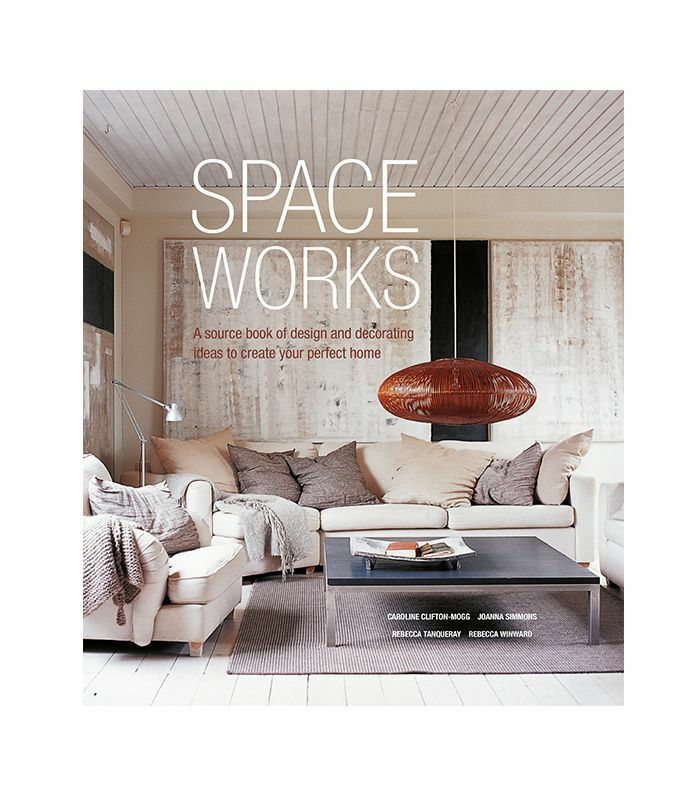 If you're looking for more design ideas, for both small and large spaces, shop Winward's new book, Space Works, below. What is your favorite kitchen design? Up next, the crazy-cool designer who specializes in all-white interiors. Images are copyright of Ryland Peters & Small. Space Works is written by Rebecca Winward, Caroline Clifton-Mogg, Joanna Simmons, and Rebecca Tanqueray.